Kudos to Irish Web Awards’ organiser, Damien Mulley, for pulling off yet another spectacular event this Saturday. This was my second time attending and yet again I was impressed by the level of detail that ensured a fun, irreverent and enjoyable evening was had by all. There were cupcakes, there were bubbles, there were glow sticks, there were a plethora of polystyrene foam creations from Made In Hollywood (we really, really wanted to take the Facebook Dislike button home with us; no doubt somebody else did and for that I’m very envious!) and, of course, there were winners. Congratulations to all the sites that were nominated and shortlisted as well as to those who took home the awards on the night. 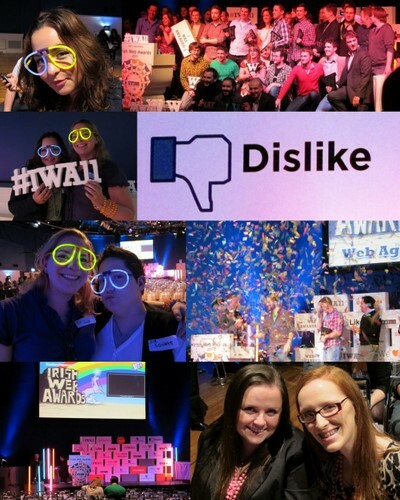 From top left: glow glasses; all the winners; polystyrene hashtag; dislike button; more glow glasses! ; The Journal taking the Grand Prix amidst a shower of confetti; the stage set; attendees. Thanks Joanne - it was a great night! Ohh looks like you had fun! Cheers Zoe - give me a glowstick and I'm happy!